Fruit is your Friend: My favorite way to combat sugar cravings has been with some fruit. Although fruit does contain fructose (a type of natural sugar), your body responds to this type of sugar differently than it would to a candy bar (glucose). Fruit also contains fiber, antioxidants and other healthy boosts. Stay away from fruit juice, but berries, like strawberries and raspberries, are a nice sweet treat that are among fruits with the lowest sugar content. Sleep, Exercise & De-Stress: A lot of people believe that sugar will help to keep you awake. Um, no. While sugar may produce a spike in your energy, what goes up, must come down and that results in a sugar crash. Make sure that you're getting enough sleep to keep you energized throughout the day and start an exercise program to boost your energy levels the healthy way. 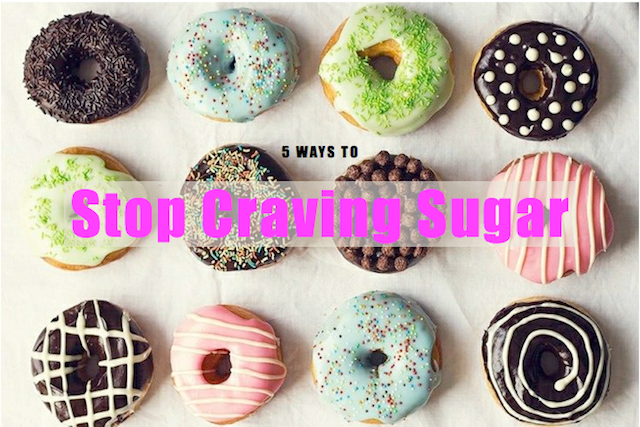 Stress can also make us crave unhealthy foods. Take a step back, a few deep breaths, and think about why you "need" that sweet treat before just digging in. Don't Get Saucy: Most sauces are filled with refined sugar. That goes for jams, tomato sauces and most asian sauces. You may make a healthy choice, but you're ruining it by slathering on the sugary sauce. Find a Replacement: In my home you won't find a single bag or box of sugar. That goes for brown sugar, cane sugar, powdered sugar etc.. Why? Because I don't need it. I've replaced all refined sugars in my home with natural, more easily digestible sweeteners. I use things like organic stevia for my morning oatmeal, raw honey for my tea and maple syrup. Try healthy substitutes (not artificial!) and you'll be pleasantly surprised at how you won't even miss your old sugar cubes. Imagine Your Perfect Body: As the saying goes, "a minute on the lips is an inch on the hips!" It's always important to remember the big picture. Sometimes all we need is a little superficial reminder to kick a bad habit. The next time you're craving sugar, google that swimsuit you've had your eye on.